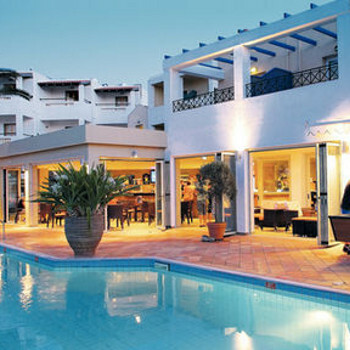 The well-maintained Malia Dedalos Aparthotel enjoys a friendly and peaceful atmosphere yet is only minutes from the famous Beach Road with its array of bars, clubs and restaurants. Newly refurbished studios are pleasantly finished. A clean friendly 2 star hotel. On check-in we had to sign a form agreeing to pay for any damages during our stay, they also kept one of the passports until we checked out. The cost of air conditioning in the room was 84 euros, which we thought was exorbitant, but as we needed to keep the doors shut at night to keep out the noise of returning guests, we had to pay it. The room was a reasonable size with twin beds. The bathroom was in need of refurbishment, with cracked shower tray, short shower curtains, and a shower head which did not fit the wall holder,so we had a wet floor every time we used it. There was a list of rules and regulations the like of which we have never seen any where in the hotels we have stayed in.There was also a list of the charges that had to be paid if anything was damaged, and even if towels or bedlinen was stained, and at hugely inflated prices. Continental breakfast was ok, but was the same every day, so after 2 weeks was very boring, it was possible to buy a cooked english if required. The pool was of a fair size, and was cleaned every evening. There were far too many sunbeds for such a small area. The main drawback for us , was that the majority of the other guests were in the 16-20 age group, with large groups of all girl and boy parties. There were also groups of slightly older men who were drinking all day around and in the the pool area, shouting and swearing. It was impossible to swim most of the time because of this. Overall we would not recommend this hotel for anyone over the age of 25. Stayed at the Dedalos for 2 weeks and was the best two weeks we could have wished for (except for the breaky not being up to much!! )room basic but very clean. hotal staff are amazing and very friendly!! Mario is lovely (He looked after my room mate when she was ill) and Charlie is an amazing cook!! you must try her sweet and sour chicken!! very highly recomended, the hotel can get a little nosey during the early hours but george on security is a dab hand at shutting the drunks up!!! Overall a fantastic hotel and good value for money!! Fantastic location right in the centre but situated in a side street so not disturbed by any noise from the main strip. Very clean but only complaint is towells and bedding only changed once during the week so next time we will take some of our own. Myself and five friends stayed at the Dedalos in early May 2006. Hotel was spotless, maid service every day except Sunday, although they did get a bit funny about us keeping one room on for six of us on the last day saying "Only two can use the room". Yeah right. Good location just off main street with all the bars and restaurants leading down to the beach but far away enough that it isnt too loud at night. Staff were friendly enough but little bit of advice. Keep an eye on your change. I had to correct them twice for short changing me which seems a bit much.